The Alaska LNG Project is a proposed liquefied natural gas export project to be constructed in Nikiski, an industrial town located on Alaska’s Kenai Peninsula, south-west of Anchorage. It is touted to be among the world’s biggest natural gas development projects. Expected to cost between $45bn and $65bn, the project will include the construction of an LNG plant, storage and shipping terminal, an 800-mile (1,287km) long pipeline from the North Slope to the LNG facility, and a gas treatment plant. It is currently in the pre-front-end engineering and design (pre-FEED) phase that is expected to be completed by late 2015 at an estimated cost of $500m. ExxonMobil, ConocoPhillips, BP, TransCanada, and the state of Alaska, which is represented by the Department of Natural Resources, Department of Revenue and the Alaska Gasline Development Corporation (AGDC), are sponsoring the project. In addition to providing access to natural gas to Alaskan people, the project will earn massive revenues for the state. It is also expected to generate between 9,000 and 15,000 jobs in the initial phases of construction and design, and additional 1,000 jobs during operation. Point Thomson field, located approximately 60 miles east of Prudhoe Bay on the coast of the Beaufort sea, is estimated to hold 25% of the total estimated gas resources in Alaska’s North Slope area. 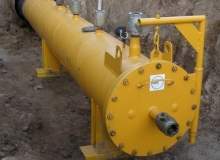 A pipeline is planned to be constructed connecting the liquefaction facility to the gas treatment plant. The 42in-diameter pipeline will have multiple compressor stations along its route and a minimum of five off-take points that will deliver gas to Alaska. It is estimated to carry up to 3.5bcf of natural gas a day. Alaska Gasline Development Corporation (AGDC) will work in consultation with the state, local communities and the public in order to identify the most viable locations for the off-take points. The proposed gas treatment plant will have three or more amine processing or treating train modules with compression, dehydration and chilling capabilities. 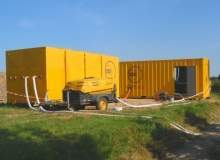 It will have a processing capacity of 3bcf of natural gas a day. The processing will involve enhancing the gas quality before transporting it to the liquefaction facility. The carbon dioxide obtained during the process will be captured and compressed for the purpose of reinjection. The liquefaction facility will have a production capacity of 20 million tonnes a year (mtpa) of LNG and process 2.5 billion cubic feet (bcf) of gas a day. It will target the growing Asia Pacific LNG market. It will be constructed in Nikiski on land that is currently used for industrial, commercial and residential purposes. More than 200 acres of land has already been acquired for the project. The plant will consist of three LNG trains with a maximum capacity of 20mtpa and a conditioning facility. Gas at the plant will be cooled and condensed to 1/600th of its original volume. 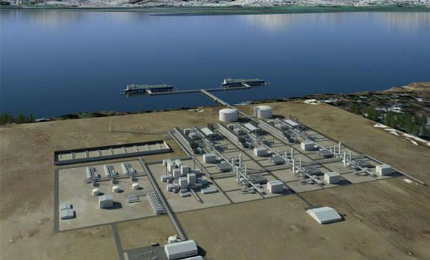 The LNG storage facility will comprise two tanks having a capacity of 160,000m³ each. The terminal will feature a loading jetty and two berths. "It is expected to generate between 9,000 and 15,000 jobs in the initial phases of construction and design, and additional 1,000 jobs during operation." The LNG project will be located near the Prudhoe Bay and Point Thomson fields that are expected to supply approximately 3.5bcf of natural gas a day. The Prudhoe Bay field will account for 75% of this supply, while the remaining 25% will be supplied by the Point Thomson field. Transmission lines will be constructed to connect the gas treatment plant to the producing fields lying on the Northern Slope. The proposed project has been granted permission to export approximately 929bcf/y of liquefied natural gas by vessels for a 30-year term that will begin either on the date of first export or 12 years from the date the authorisation is issued (21 November 2026), whichever occurs first.